Whether you are up for hiking or planning fun water activities, a wine lover, winter sports enthusiast, or just looking for a quiet and relaxing time while sitting on the patio and admiring the great outdoor views, you will find it all in our home and neighborhood. 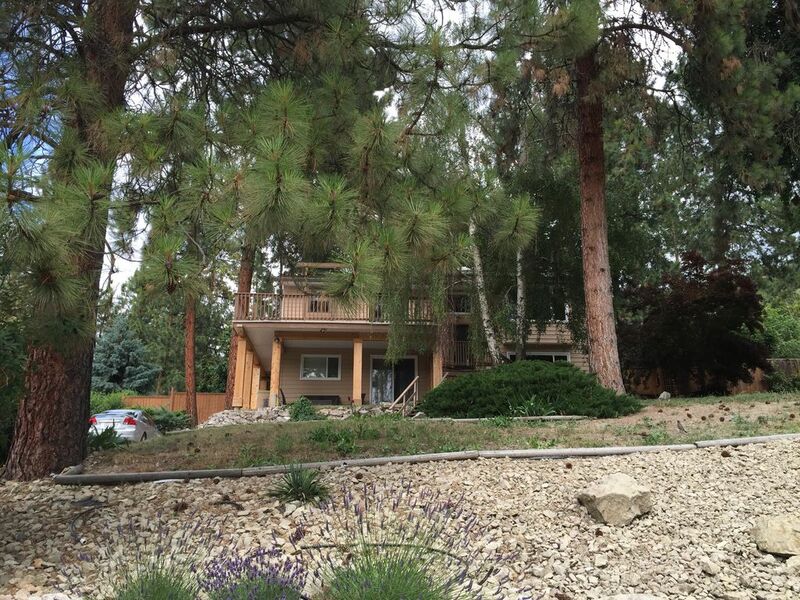 The house is located in peaceful McKinley Landing neighborhood of Kelowna, just 2 streets away from Okanagan Lake. The area is very quiet and is only 5 minutes walking distance to a beautiful neighborhood beach. Our place is a two storey house, with the rental unit on lower level. It includes kitchen with dining area and living room, 2 bedrooms with queen beds, and 1 and 1/2 bathroom. It comfortably accommodates 4 adults. It also has optional sleeping on the living room sofa bed. The place has been completely renovated inside and there is a walk out to a covered patio area with a Lake and Mountain View. There are also lots of parking spots!! McKinley Landing is located in north Kelowna, a quick drive from the Kelowna International Airport. The area has quiet seclusion with spectacular sunsets, bald eagles, deer and the scent of Ponderosa Pine trees. McKinley Landing is also an ideal location to enjoy winter attractions with Silver Star Ski Resort and Big White Ski Resort less than an hour’s drive away, with some of the best champagne powder that Canada has to offer. Our vacation rental unit provides a great base to relax in after a day out. Parking for tenants available. There is also additional free parking for boat and truck if required. From the very beginning of my booking, the owners were welcoming and warm; they provided great detail and information on the property and are very responsive to any questions or needs you may have. The property is comfortable and welcoming, the location provides amazing views of the lake and surrounding mountains; excellent for walks and hikes! The neighborhood is quiet and tranquil perfect for retreating in the evenings and having a glass of wine with your meal while enjoying the views. Downtown is a short drive and there are plenty of nearby choices for restaurants (if you desire a night out)! Lovely well maintained home in a peaceful location. A great getaway in a beautiful neighborhood. The property was in a peaceful area close to the lake. The apartment was very comfortable, updated and very clean with a lot of room to spread out. The beds were comfortable and the kitchen was well stocked. My husband and I enjoyed our evening time on the peaceful patio overlooking the quiet neighborhood in the pines with a glimpse of the lake. If you are looking for a place to relax this is a great choice. Only about 15 minutes north of the airport. The owners were very responsive although we did not have the pleasure of meeting them. We will definitely look to stay there again! We really enjoyed our stay at the cozy house. The property is in a peaceful and beautiful neighbourhood, away from the busy part of Kelowna but just a short drive away. Loved the decor in the house. Felt clean and was a good amount of space for our family to be comfortable and feel "at home" while on vacation. Will look to stay here again for our next Kelowna visit!